You will find bellow some guide lines of the TEP concept. - Using the parametric effect in a bifilar coil as an energy pump. When the circuit is closed on the Bifilar coil, the inductance drops rapidly near zero and the energy strored in the coil increases dramaticaly. During this energy growth in the TEP, I think that a kind of "siphon effect" must act in the TEP coils Vs ZPE (Zero Point Energy). This "siphon effect" will tap additional ZPE energy like a vaccum pump using water. The additional energy tapped in the ZPE ( with the parametric effect in the TEP ) seems the only way to "regauge" the system and achieve an Overunity device. Unlike a mechanical device ( the SMOT/RMOD device or an Overunity Magnetic motor ) which uses gravity or a little magnetic pulse to regauge itself, the TEP uses the parametric effect as a "siphon" Vs ZPE to regauge itself. The disruption effect due to the parametric effect in the bifilar modifies the time constant of the circuit (L/R), thus the energy flows. The disymetry between the S-Flow (Poynting flow) running outside and the Time Flow compression inside the circuit (time constant compression) is the main cause of the Pumping effect in the ZPE. Today, I think that the TEP is "a way" to achieve a good Overunity device. Today the TEP uses bifilar coils technologies in parametric conditions, but tomorrow, other kinds of process could be used to pump the Zero Point Energy. 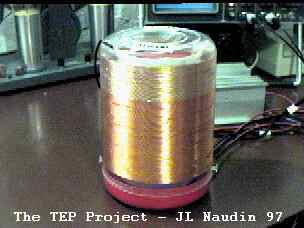 The only purpose of the TEP device is the creation of a disymetrical flow of energy between the outside flow energy (Poynting S-Flow) and the inside ( current flow in the wires ) during the energy flow from Source to Load and I think, today, that it is a good way to Free Energy. The main advantage of the TEP is that it is a solid state device with no moving parts. There is a great number of regauging steps due to the working frequency, thus the ZPE energy tapped may be enormous.